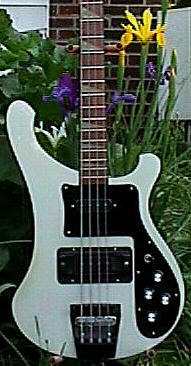 One of the more unique finishes used by Rickenbacker International Corporation was that of “Silver.” This finish is on the record books as having been offered from 1980-1984, however, a keen eye and some sleuthing will reveal that the instruments finished in Silver continued to roll off the assembly line for at least another five years. 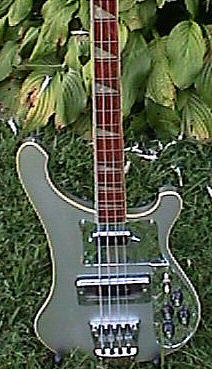 Thus far only one-quarter of one percent of the instruments in the Rickenbacker Registration Page Registry have a silver finish so, while unique, it would be difficult to argue that this colour was a big seller for RIC. The finish can perhaps be best described as a dark silver as opposed to a the bright shiny colour that one frequently draws from memory when thinking of silver coin. It is difficult to photograph and consequently depending on the amount of flash and other lighting, the colour can appear to range from a dull and more subdued gray finish to the iridescent and shinny appearance of polished sterling. The clear coat lacquer breaks down over time and the resultant senescent yellowing produces a green cast as captured by the photo above. 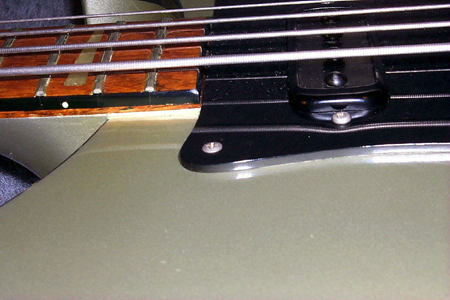 The following series of pages have been posted to portray the characteristics of the Rickenbacker Silver finish in a cross-section of instruments over the Rickenbacker age-span from 1981 to 1989. 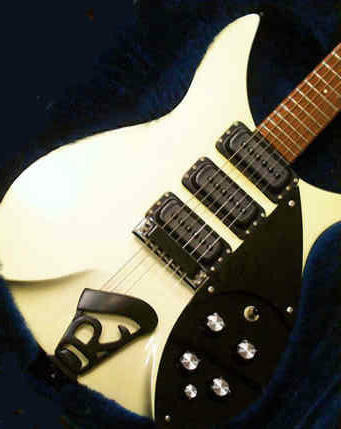 Should you have a “Rickenbacker in Silver” please send along a photo and the details of your instrument so that it may be added to this article. Perhaps the most striking Rickenbacker in silver finish that I have seen thus far is the 1981 Model 4001 above, kindly posted here with the permission of Mike Parks. If I didn’t have a silver already, I would be tempted by this instrument. The white binding on this instrument in concert with the mirror pickguard just cries out for playing. Surely this is an appearance that would have enticed Guinevere. This instrument emits an interesting colour that appears to glow in the dark of night. The flash and yellowing have produced a bleaching effect that moves the typical greenish cast more toward yellow. The black hardware and pickups of this 320 provide for a nice contrast and it most eye-catching. The silver topped control knobs are also a salient feature on this instrument. The factory was on the right track when they designed this one. No matter what the surroundings, this instrument provides for a silver lining. The lighting in the above photo provided just the right conditions to catch the true silver-gray finish. The black hardware is certainly the way to go with this instrument with a delightful contrast evident. 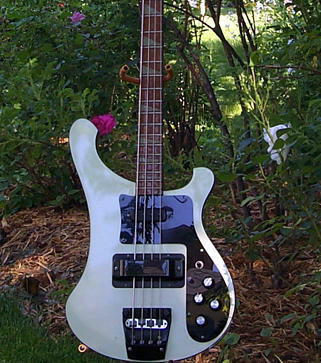 The black pickup cover also adds to the overall look of this beautiful playing 4003 bass. The colour also compliments the increasing gray, no make that silver, highlights in the hair of its owner. Enough said. The photo below provides an example of a 1989 Model 4003 Silver with identical features to the photo above. The photo of the 1989 model is illustrative of the slight green cast associated with lacquer yellowing. This instrument combines a great silver finish with a fretboard that is made for steel guitarists. Not only a wonderful player but a sterling look with very clean lines. The black control knobs and hardware provide for a most classic look. This guitar has a big humbucking sound and a terrific solidbody sustain that won’t quit. The final touch is the black nameplate with the Rickenbacker name that is accented by the beautiful silver headstock and body. With the 360 New Style most frequently seen in Fireglo, the silver finish on this instrument is most novel. The black trim and hardware provides for a nice contrast on the 360 as well. Just as the triangle fret markers are accented on the Model 4003 Silver so too do they become most salient on the 360 silver.